Book Making: Supreme stupidity: Shouldn't an American publisher understand the English language? Supreme stupidity: Shouldn't an American publisher understand the English language? The person or robot that does advertising for AuthorHouse doesn't understand the English language. The first two sentences above say, "You set your self-publishing goals. As your book publisher..."
If someone is self publishing, she or he does not get published -- she or he publishes! 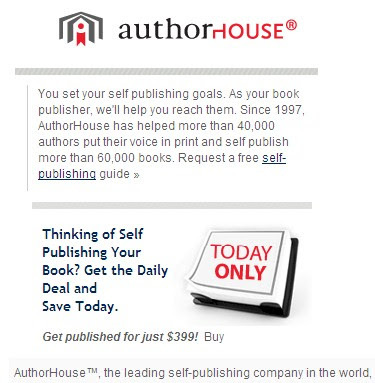 At the bottom, we read that AuthorHouse is "the leading self-publishing company in the world." That's an interesting claim, and an impossible, illogical claim. 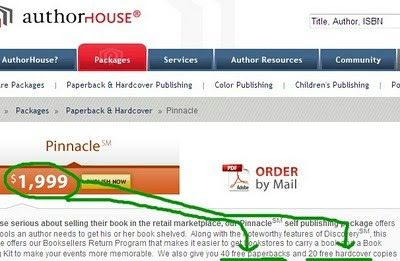 AuthorHouse is not a self-publishing company, leading or otherwise. Except for a small book business set up by a self-publishing author, there is no such thing as a self-publishing company. No company can self-publish for an author. Only the author can self-publish the author. The Author House website offers "free" books with various publishing packages. As shown above, you can 60 "free" books with their Pinnacle package. However, those 60 books are free only if the customer/victim ignores the $1,999 that must be paid to get the "free books." Doesn't anyone at AuthorHouse know what "free" means? It's not a very complicated word. If the books are really free, you shouldn't have to pay nearly two thousand bucks to get them.